Former Philadelphia Flyers farmhand Marcel Noebels made his season debut in a most memorable Deutsche Eishockey Liga match as visiting Eisbaeren Berlin, after being shutout for more than forty-four minutes of play, rallied in dramatic fashion to defeat host Koelner Haie 3-2 in overtime. A late first period goal from 32-year-old Canadian legionnaire Chris Minard, the veteran left wing who once skated in 40 NHL games for the Pittsburgh Penguins and Edmonton Oilers but is now in his third D.E.L. season with Koelner Haie after leaving the American Hockey League’s Grand Rapids Griffins, was beginning to loom rather large, particularly after national team goaltender Danny aus den Birken, the 29-year-old who made his major international debut for Germany at the 2014 IIHF World Championships in Scandinavia last spring, had turned aside every one of the 37 Eisbaeren Berlin shots he faced in the first two periods. But Eisbaeren Berlin goaltender Petri Vehanen had made what would prove to be a most pivotal save after Koelner Haie had been awarded a penalty shot roughly eight and a half minutes into the second period. One might expect such heroics from the 37-year-old veteran who has, in recent seasons, earned a gold medal while backstopping the Finland national team at the 2011 IIHF World Championships and celebrated two Kontinental Hockey League playoff titles, with Russian club Ak Bars Kazan in 2010 as well as Czech outfit HC Lev Praha in 2014. 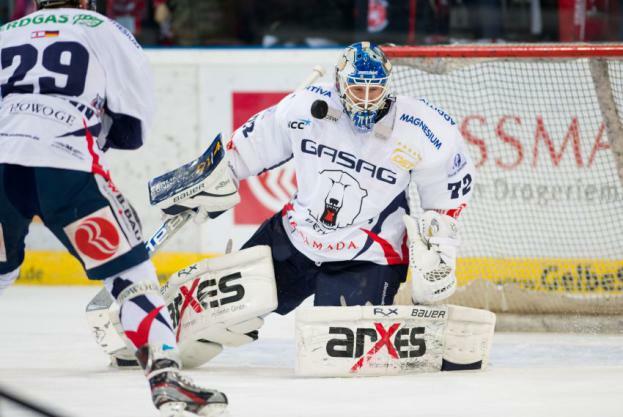 The highly experienced Vehanen was specifically signed by Eisbaeren Berlin during the summer to replace the departed Germany national team netminder Rob Zepp, now of the American Hockey League’s new Lehigh Valley Phantoms club. With nearly five minutes of the final frame already gone, imported Czech right wing Petr Pohl, the well-traveled 28-year-old who was chosen in the fifth round (# 133 overall) of the 2004 National Hockey League Draft by the Columbus Blue Jackets and appeared in 10 AHL games for the Syracuse Crunch over the course of three seasons, finally got visiting Eisbaeren Berlin on the scoreboard after picking up a rebound in the slot; the summer transfer from Czech Extraliga club HC Karlovy Vary was involved again when veteran Germany national team defenseman Frank Hoerdler leveled the score on a long slapshot from the center point position with a little less than three minutes remaining to be played. Eisbaeren Berlin grabbed the victory in overtime when Germany national team defenseman Constantin Braun, the sixth round selection (# 164 overall) of the Los Angeles Kings at the 2006 NHL Draft, made a hustling play to chase down his own rebound behind the Koelner Haie net and alertly found Canadian legionnaire Julian Talbot, the 29-year-old veteran now in his fourth season with the German capital city club after spending four years skating in the AHL for the Peoria Rivermen and Lake Erie Monsters, all alone at the right side of the cage for what amounted to a relatively easy tap-in Siegtor. Noebels had three shots on goal and finished with a + 1 defensive rating while skating on a productive Eisbaeren Berlin line with Pohl and Finland national team veteran Antti Miettinen, the Olympic bronze medal winner who skated in 539 NHL games for the Dallas Stars, Minnesota Wild and Winnipeg Jets. Eisbaeren Berlin center Antti Miettinen, the Finland national team veteran who totaled 97 goals and 230 points in his lengthy NHL career, leaps into the air while trying to deflect a shot as well as screen out Koelner Haie goaltender Danny aus den Birken during the exciting Deutsche Eishockey Liga contest at the Lanxess Arena. Eisbaeren Berlin goaltender Petri Vehanen, the Finland national team veteran who has appeared at the annual IIHF World Championships on four occasions, stops the second period penalty shot from aging Koelner Haie defenseman Mirko Luedemann, the 40-year-old veteran who appeared on the German blue line at 12 major international tournaments (63 ga, 5 go, 17 pts) including three Winter Olympic Games during the course of his distinguished career. An early goal to set the tone as well as stiffling defensive play throughout the contest enabled visiting KOELNER HAIE to completely thwart two-time defending champion EISBAEREN BERLIN 3-1 and reclaim top spot in the Deutsche Eishockey Liga standings. For the first time in quite a while, Eisbaeren Berlin dressed more than six natural defenseman and were able to shift Canadian legionnaire JULIAN TALBOT, the 27-year-old left wing who has scored 13 goals all competitons for trainer DON JACKSON’s team this season, back onto a forward line. But Canadian legionnaire JAMIE ARNIEL was forced to miss a game for the first time in the Deutsche Eishockey Liga this term and the second-leading scorer for the capital city club this season, T.J. MULOCK, still has not returned. Furthermore, defenseman FRANK HOERDLER as well as left wing and captain ANDRE RANKEL were both coping with contusions and not operating at full fitness for the hosts. It was UWE KRUPP’s side who started off fast in this clash of clubs trained by former NHL defensemen each who lifted the coveted Stanley Cup during their respective playing careers. A long home-run pass from Koelner Haie’s imported Swedish defenseman ANDREAS HOLMQVIST, only just beyond his own goal line in the right face-off cirle of the defensive zone, found seasoned Canadian legionnaire NATHAN ROBINSON all alone at the blue line along the left wing. The 31-year-old NHL veteran signed by the Cologne Sharks this past summer from Austrian outfit UPC Vienna Capitals quickly sped in on his former teammate of two years with Eisbaeren Berlin and nimbly backhanded past netminder ROB ZEPP to score his seventh goal in the D.E.L. this term after just three minutes of play. Koelner Haie’s seasoned Canadian legionnaire NATHAN ROBINSON (10), the native of Scarborough, Ontario, who collectively skated in seven NHL contests (0 go, 0 pts) for the Detroit Red Wings and Boston Bruins before signing with D.E.L. club Adler Mannheim in the summer of 2006, goes top shelf to beat Eisbaeren Berlin goaltender ROB ZEPP (72) during the Deutsche Eishockey Liga contest at the sold-out O2 World Arena Berlin. Eisbaeren Berlin had far more of the opportunities while outshooting their guests 14-8 in the first period but were unable to solve Koelner Haie’s in-form goaltender DANNY AUS DEN BIRKEN. Down at the other end, Germany national team netminder ROB ZEPP would weather a severe storm in the second period as the visitors fired no fewer than 21 shots on target. Koelner Haie center FELIX SCHUETZ, the 25-year-old former Buffalo Sabres farmhand who scored the memorable overtime goal that allowed Germany to knock off the United States in front of a record crowd of 77,803 specatators at the 2010 IIHF World Championships, did shoot a second puck into the net for Koelner Haie in the second period at the O2 World Arena Berlin, but the strike was correctly waved off on account of a crease violation. No luck on this occasion for Schuetz, who is the second-leading scorer for Koelner Haie this season having already shot 16 goals in the Deutsche Eishockey Liga. Eisbaeren Berlin left wing FLORIAN BUSCH (26) cannot prevent Koelner Haie’s imported Swedish defenseman ANDREAS HOLMQVIST (7), the 31-year-old former second round NHL draft pick (# 61 overall, 2001) of the Tampa Bay Lightning who transferred to the North Rhine-Westphalian club this past summer from IF Djurgarden Stockholm, from winding up for a booming slapshot during the D.E.L. contest at the sold-out O2 World Arena Berlin. Nearing the halfway point of the third period, the hosts hauled themselves level and appeared to have made a whole new game of it. Veteran defenseman JENS BAXMANN pushed up into the left face-off circle and effectively one-timed the pass from behind the net by Canadian legionnaire DARIN OLVER, the 27-year-old center who led Eisbaeren Berlin in scoring last season, to net his third goal in the Deutsche Eishockey Liga this term. Finally, the sell-out crowd at the O2 World Arena Berlin had something to shout about. But this joy would be very short-lived as the visitors did, in fact, regain the lead a scant 55 seconds later. Koelner Haie’s other imported Swedish defenseman, the 2006 Olympic gold medalist DANIEL TJARNQVIST, penetrated deep into the offensive zone on a weaving rush before delivering a perfect centering pass from the left wing. ROK TICAR, the 23-year-old center who scored three goals in five games for Slovenia at the 2011 IIHF World Championships hosted by Slovakia, had no trouble re-directing the puck past Zepp to score his eighth goal of this D.E.L. campaign and immediately silence the disappointed crowd. Eisbaeren Berlin had one final chance to equalize again when Schuetz picked up a two-minute minor and the accompanying ten-minute misconduct penalty for checking-from-behind with just 2:18 remaining in the match. Not surprisingly, Jackson removed the Eisbaeren goaltender in favor of an extra attacker to provide Berlin with six skaters as compared to the four of Koelner Haie. But this particular gamble did not pay off as veteran defenseman MIRKO LUEDEMANN, the aging 39-year-old rearguard who earlier in his career represented Germany at 12 major international tournaments (63 ga, 5 go, 17 pts) including the 1994, 1998 and 2002 Winter Olympic Games, was able to loft a Borje Salming specialty all the way down the ice for the clinching empty-net goal. Defending champion Eisbaeren Berlin and serious contender Koelner Haie split the four-game season series, then, with each side having each celebrated both of their victories in the other team’s building. Eisbaeren Berlin’s Canadian legionnaire DARIN OLVER (40), the former Northern Michigan University center and New York Rangers’ 2nd round NHL draft pick who led the German capital city club in scoring last season, looks to fake out a very focused Koelner Haie goaltender DANNY AUS DEN BIRKEN (33), the 27-year-old who was a reserve on the Adler Mannheim squad that claimed the D.E.L. 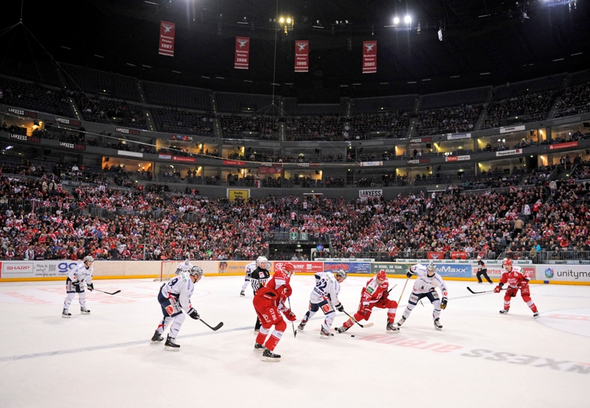 title in 2007, during the Deutsche Eishockey Liga contest watched by the sold-out crowd of 14,200 spectators at the O2 World Arena Berlin. Two goals from the suddenly in-form Danish import and shutout goaltending over the final two periods from the veteran netminder enabled the visitors to rally from an early deficit as visiting two-time defending champion EISBAEREN BERLIN defeated hosting league leader KOELNER HAIE 4-1 in this Deutsche Eishockey Liga clash of titans. American trainer DON JACKSON had called for more emotion and intensity from Eisbaeren Berlin, who had fallen to seventh place in the D.E.L. standings after not having played a domestic league match last weekend, in the wake of the loss to Austrian club UPC Vienna Capitals in the quarterfinal of the Red Bull Salute – European Trophy Finals. The D.E.L. 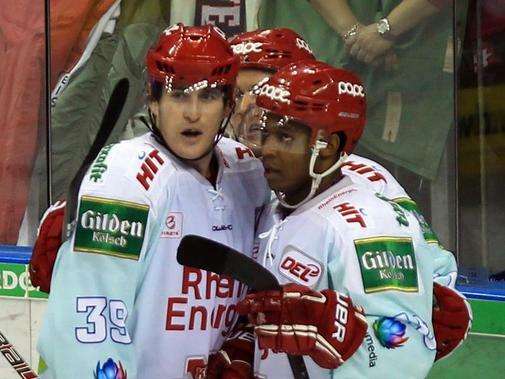 encounter with the table-toppers Koelner Haie away at the Lanxess Arena in North Rhine-Westphalia would, of course, prove itself to be a stiff challenge for Jackson’s charges. And, of course, Eisbaeren Berlin were in very real danger of experiencing defeat for a fifth time in its last six contests. And, as has been the case all season long, Eisbaeren Berlin had manpower issues both on the blue line as well as elsewhere. Once again, the versatile Canadian legionnnaire JULIAN TALBOT was deployed on defense by Jackson. In the continued absence of Canadian legionnaire MATT FOY, the veteran NHL forward who also missed the Red Bull Salute tournament in Vienna last week as a result of injured ribs, the defending German champions dressed only 17 skaters for the D.E.L. contest with former Germany national team trainer UWE KRUPP’s Koelner Haie. 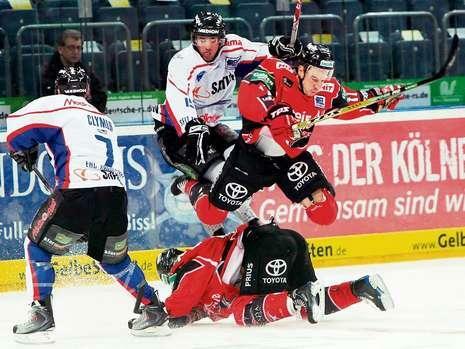 Koelner Haie forward ALEXANDER WEISS (43), the 25-year-old former Eisbaeren Berlin youth team product who is in his second season with the table-topping North Rhine-Westphalian club now, skips into the air during the penalty-filled Deutsche Eishockey Liga contest with his former employers at the Lanxess Arena in Cologne. 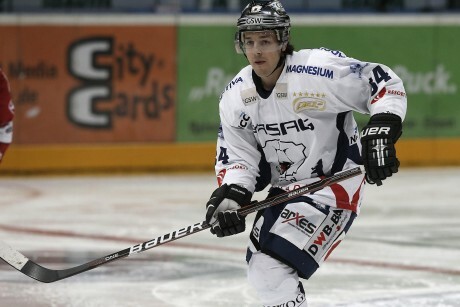 Koelner Haie, for its part, were without Germany national team left wing PHILIPP GOGULLA, the former Buffalo Sabres farmhand who ranks fifth on Krupp’s club in scoring this season with 20 points (nine goals) from 26 D.E.L. contests. This, however, did not prevent the hosts from taking the lead when a low shot from along the boards by seasoned Canadian legionnaire CHARLIE STEPHENS, the 31-year-old now in his seventh campaign of Deutsche Eishockey Liga competition, eluded both the traffic in front as well as Eisbaeren Berlin goaltender ROB ZEPP almost nine minutes into the festive match at the Lanxess Arena . Stephens’ seventh goal of this D.E.L. season allowed the veteran center who once skated at total of eight National Hockey League games (0 go, 2 pts) for the Colorado Avalanche, to assume the current scoring lead for Koelner Haie with 27 points, exactly one ahead of imported defenseman ANDREAS HOLMQVIST (6 go, 20 as), the 31-year-old who was acquired by Krupp’s team this past summer from Swedish club IF Djurgarden Stockholm. 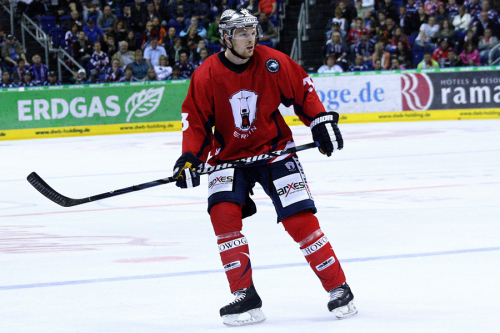 Prior to the current three-game goal-scoring streak now being enjoyed by MADS CHRISTENSEN (60), the diminutive center who has represented Denmark at five major international tournaments in his career (29 ga, 9 go, 12 pts), a full eighteen contests had come and gone since Eisbaeren Berlin had last gotten a goal from the former Iserlohn Roosters skater who originally arrived in Germany after leaving IK SonderjyskE in the summer of 2009. Significantly, the defending champions responded a scant 25 seconds after falling behind the league leaders at the Lanxess Arena. Eisbaeren Berlin’s Canadian legionnaire MARK KATIC, the 23-year-old, former New York Islanders prospect who finished as the top scoring defenseman for the entire 2012 European Trophy tournament with nine points in as many matches, found Danish import MADS CHRISTENSEN in the slot with an airborne pass. Although the 25-year-old’s back was to the net, a spin-around move and accurate wrist shot right over the glove of Koelner Haie goaltender DANNY AUS DEN BIRKEN after the puck had been settled silenced the majority of the 15,234 spectators on hand. The goal not only evened the game, but marked a third consecutive contest in which Christensen, who had entered having netted just three times in 21 D.E.L. matches this season, had lit the lamp for Eisbaeren Berlin. Roughly a minute later, however, the visitors initiated a parade to the penalty box which began when youthful right wing LAURIN BRAUN was whistled for charging and would include two separate trips to the sin bin by the Eisbaeren Berlin goal-scorer Christensen, himself. Canadian legionnaire MARK KATIC (71), the 23-year-old defenseman who skated 11 NHL games for the New York Islanders before signing with Eisbaeren Berlin this past summer, and veteran Koelner Haie captain JOHN TRIPP (21), the 35-year-old Germany national team veteran who contested nine NHL games for the New York Rangers exactly a decade ago, watch as Swedish import ANDREAS FALK (71) fails to score during the Deutsche Eishockey Liga match at the Lanxess Arena in North Rhine-Westphalia. Krupp’s club made several legitimate efforts to cash in on all the power play time but would be frustrated by both bad luck and sensational goaltending. Both chances involved the unfortunate import ANDREAS FALK, the 29-year-old center who just signed in the summer after having won two Elitserien titles in six seasons with Swedish side HV 71 Jonkoping. Despite having racked up 19 assists in his first 27 matches in the German top flight, the snake-bit Falk still has only managed to score just one goal for his new Koelner Haie club this term. First, a shot from seemingly-cursed Falk clanked off the iron and then, roughly a minute and a half later, Zepp outright robbed the Swedish center after an outstanding passing play started by experienced Canadian legionnaire NATHAN ROBINSON, the well-traveled, 30-year-old former Eisbaeren Berlin forward who arrived from Austrian club UPC Vienna Capitals this past summer. The game changed forever, though, when Koelner Haie carelessly lost possession of the puck near their own blue line with less than a minute to play in the opening period. The lurking Braun took charge of the little black disc and patiently waited to find Christensen. Rather than shoot right away, the Danish import also wisely waited, went the wide route and drew aus den Birken out of position enough to lift a short-sided wrist shot into the net and give Eisbaeren Berlin a 2-1 lead with just 49 seconds left until the first intermission. Eisbaeren Berlin’s Denmark international center MADS CHRISTENSEN (60) celebrates his second goal of the game at the expense of Koelner Haie netminder DANNY AUS DEN BIRKEN (33) and fifth strike of this 2012/13 D.E.L. season during the first period of the German top flight contest at the Lanxess Arena in North Rhine-Westphalia. The hosts were lucky not to have fallen behind by a pair of goals after the point shot of Eisbaeren Berlin’s Germany national team defenseman FRANK HOERDLER bounced harmlessly off the lower right post early into the second period … but the fortunes of Koelner Haie did take a radical turn for the worse just about four minutes later. Eisbaeren Berlin left wing FLORIAN BUSCH, the 26-year-old who was a member of Germany’s 2006 Olympic squad at the 2006 Winter Games hosted by Turin in Italy, led a rink-length rush before gaining the zone and dealing the puck to American import BARRY TALLACKSON on the right wing. The Koelner Haie goaltender made the save from the shot by the former University of Minnesota forward who won two NCAA national championships with the Golden Gophers in his college career and was named the MVP of the D.E.L. playoff final series for the German capital city club last spring. But, to the home side’s peril, the rebound appeared to riccochet off the skate of the eagerly on-rushing, imported American defenseman JIMMY SHARROW and definitely ended up in the back of the net at the 7:54 mark of the second period. It was a controversial play, to be certain, and one that the two match referees reviewed with the video equipment at the bench for quite some time before finally deciding to award the goal. After having been the victim of an astonishing decision on the first goal scored in the Red Bull Salute quarterfinal match against Austrian club UPC Vienna Capitals on their last outing, it may have been a case of bad calls evening themselves out over the course of a long season. Whatever the case, Sharrow’s second goal in the D.E.L. this term afforded Eisbaeren Berlin a 3-1 advantage as the whistles of disapproval came in abundance from the large crowd at the Lanxess Arena. Eisbaeren Berlin’s imported American JIMMY SHARROW, the native of Framingham, Massachusetts, who was selected out of Canadian junior hockey by the Atlanta Thrashers in the fourth round (#110 overall) of the 2003 National Hockey League Draft, led all defensemen from the 32 teams who participated in the 2012 European Trophy tournament this season with five goals scored. A little over halfway through the contest with visiting Eisbaeren Berlin, the hosts received a fourth power play of the game when Tallackson skated off to the box for cross-checking. But Koelner Haie were foiled yet again by the effectient penalty-killing of the visitors, which included both organized defense as well as solid goalkeeping by the veteran Zepp. And so, despite having outshot their guests 23-19 over the first forty mintues of play, Krupp’s club found itself trailing by two goals when the second intermission began. 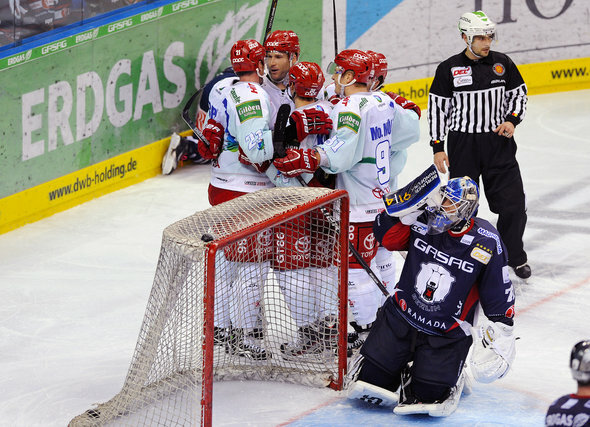 Almost six minutes into the final period, Sharrow handed Koelner Haie a fifth opportunity of the match with the man-advantage by drawing a charging penalty. But, again, Eisbaeren Berlin were more than equal to the task at hand. And so, perhaps, the hosts became even more desperate than ever when Hoerdler went to the sin bin at the 48:22 mark of the D.E.L. match. And even more forgetful about defending on the power play, then, because Eisbaeren Berlin’s star Canadian legionnaire DANNY BRIERE was permitted to collect a long clearance from Sharrow near the Koelner Haie blue line, then. A sharp, rising shot from the locked-out NHL exile gave the visitors a shorthanded goal just 13 seconds into Hoerdler’s penalty for high-sticking as well as a commanding 4-1 lead on the scoreboard. It was a seventh strike in the German elite league for the 35-year-old veteran who has totaled 330 goals both regular season and playoffs, combined, in the vaunted National Hockey League. Koelner Haie would actually have still one more chance on the power play when Eisbaeren Berlin’s long-serving defenseman JENS BAXMANN also picked up a two-minute penalty for high-sticking at 9:48 of the third period but that was negated when the Swedish import Falk was punished for hooking just three seconds later. Krupp’s club wound up outshooting their guests 33-26 but were, once again, unable to adequately deal with Zepp, who, to review, posted a shutout in his last appearance at the Lanxess Arena earlier this season. The Eisbaeren Berlin netminder has noticeably improved after registering a .909 save percentage after his first 16 appearances in the Deutsche Eishockey Liga this season. Over Zepp’s last eight games in the D.E.L., the 31-year-old veteran has turned aside 290 of 307 shots faced for a far better .945 save percentage. Eisbaeren Berlin’s star Canadian legionnaire DANNY BRIERE, the exiled Philadelphia Flyers right wing who is now tied for the scoring lead on the German capital city club with 28 points in the Deutsche Eishockey Liga, celebrates his back-breaking, shorthanded goal in the third period against Koelner Haie at the Lanxess Arena. 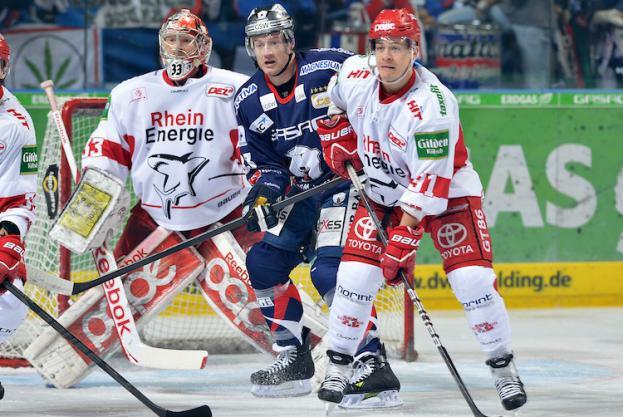 The decisive victory over Koelner Haie proved to be the first win outside of the O2 World Arena Berlin for the two-time defending Deutsche Eishockey Liga champions after five consecutive losses on the road in all competitions. Of course, the schedule for Eisbaeren Berlin has been brutal as of late with Jackson’s troops having skated 12 of the their last 16 contests away from their regular home rink near the German capital city’s Ostbahnhof. Even further, Eisbaeren have been the visitors in five of their last six matches. Eisbaeren Berlin’s last win away win had been the 3-0 shutout over the very same Koelner Haie club back on November 18. Koelner Haie captain JOHN TRIPP (21), the aging veteran who also skated 34 NHL games for the Los Angeles Kings during the 2003/04 campaign, throws snow alongside Eisbaeren Berlin goaltender ROB ZEPP (72) during the Deutsche Eishockey Liga contest witnessed by 15,234 spectators at the Lanxess Arena in Cologne, North Rhine-Westhphalia. Koelner Haie defenseman DANIEL TJARNQVIST, the 36-year-old, National Hockey League veteran who won the Olympic gold medal with Sweden at the 2006 Winter Games in the Italian Alpine city of Turin, and Eisbaeren Berlin’s Canadian legionnaire DARIN OLVER (40), the one-time 2nd round NHL draft pick of the New York Rangers who led the entire German elite league in scoring for the Augsburg Panthers during the 2010/11 season, compete for the puck during the Deutsche Eishockey Liga contest at the impressive Lanxess Arena in the North-Westphalian city of Cologne. A battle between the current leaders in the Deutsche Eishockey Liga and the defending circuit champions was decided by three goals in the second period from the visitors from the German capital city and shutout netminding from the national team veteran as EISBAEREN BERLIN blanked KOELNER HAIE 3-0 in an important D.E.L. fixture on the heels of the recently-completed international break. Two-time defending titlist Eisbaeren Berlin, who had lost in overtime to Krefeld Pinguine two days earlier, were in danger of dropping a third D.E.L. contest in a row while Koelner Haie, who are trained by former Stanley Cup-winning defenseman and Germany national team trainer UWE KRUPP, were looking to further extending their lead in the domestic top flight. Koelner Haie, of course, had won the first meeting of the season at the O2 World Arena in Berlin, a high-scoring 6-5 affair which had witnessed the pair of National Hockey League, Canadian legionnaires DANNY BRIERE and CLAUDE GIROUX, dramatically make their D.E.L. debuts for Eisbaeren. Koelner Haie winger PHILIP GOGULLA (87), the former Buffalo Sabres farmhand who fashioned two critical assists in the match against Canada as well as a vital empty-net goal late versus Switzerland for host nation Germany at the 2012 Deutschland Cup tournament in Bavaria, unleashes a shot against Eisbaeren Berlin during the Deutsche Eishockey Liga contest at the Lanxess Arena in Cologne. Koelner Haie had the better of play, too, in the first period of play at the Lanxess Arena in the second match, as well. But Eisbaeren Berlin goaltender ROB ZEPP, the national team veteran who had performed well in between the pipes for Germany against his native Canada in the first round of the 2012 Deutschland Cup, had sat out the Friday night loss to Krefeld Pinguine and was rested and ready. The hosts, indeed, would send a bakers’ dozen shots in the net guarded by Zepp but, nevertheless, find nothing of any substance to celebrate about. This despite having even been awarded a penalty shot twelve minutes into the opening period, as well, courtesy of Eisbaeren Berlin’s Germany national team defenseman CONSTANTIN BRAUN. But Koelner Haie center FELIX SCHUETZ, the former Buffalo Sabres farmhand who scored a famous goal for Germany 21 seconds into overtime to defeat the United States in front of 77,803 spectators at the Veltins Arena in Gelsenkirchen during the 2010 IIHF World Championships, made a good case for the old adage that ‘he who hesitates is lost’. And, thus, Zepp was able to easily halt his 2012 Deutschland Cup constituent at the Lanxess Arena. Eisbaeren Berlin defenseman JENS BAXMANN (29) watches as brave Torhueter ROB ZEPP, the native Canadian who spent the majority of his first four seasons as a professional tending the nets for the Florida Everblades in the East Coast Hockey League, takes a shot off the face during the Deutsche Eishockey Liga contest with table-toppers Koelner Haie at the Lanxess Arena in the western German state of North Rhine-Westphalia. The hosts also had an outstanding opportunity to score at the beginning of the second period, as well, but Koelner Haie winger PHILIP GOGULLA, the experienced national team peformer who led Germany with nine points at the 2012 IIHF World Championships in Scandinavia last spring, could only hit the side of a wide-open net. And so it was the visitors from the German capital city who gratefully grabbed the lead almost three minutes into the middle frame. Eisbaeren Berlin’s Canadian legionnaire JULIAN TALBOT, the forward-turned-defenseman who represented his homeland at the recently-completed Deutschland Cup in Bavaria, gained the zone and then dropped the puck for team captain ANDRE RANKEL, the Germany national team veteran who was not selected for the 2012 Deutschland Cup by incoming trainer Pat Cortina, at the blue line. A point shot from Rankel not only eluded Koelner Haie reserve netminder YOURI ZIFFZER for the 1-0 Eisbaeren lead but also provided the 27-year-old winger with an eighth goal in the D.E.L. this term. Roughly three and half minutes later, Eisbaeren Berlin doubled its lead against the league leaders. Germany’s 2010 Olympic veteran T.J. MULOCK, the native Canadian who leads American trainer DON JACKSON’s club in scoring this season, initiated a fancy-enough passing play which would involve all three forwards. Mulock, himself, then simply squared the puck for on-rushing defenseman JENS BAXMANN, the 27-year-old veteran who made his 500th career appearance for Eisbaeren Berlin earlier this fall, to bag his second goal of this German elite league season. Eisbaeren Berlin were without star Canadian legionnaire CLAUDE GIROUX, the locked-out Philadelphia Flyers center who had sustained a blow to the head in the preceding match against Krefeld Pinguine, for the clash with Koelner Haie at the Lanxess Arena. Giroux, of course, had registered a goal and three points on his Deutsche Eishockey Liga debut in the loss to Koelner Haie earlier this season in Berlin. By this point, however, the two-time defending champions seemed to be getting along just fine without the NHL-Superstar who had totaled 19 points (four goals) from his first nine D.E.L. games in Germany. Koelner Haie captain JOHN TRIPP (21), the 35-year-old former National Hockey League right wing and Germany 2010 Olympic squad veteran who scored two goals against Eisbaeren at the O2 World Arena Berlin earlier this season, watches visiting netminder ROB ZEPP (72) make yet another save during the D.E.L. contest at the Lanxess Arena in Cologne. Eisbaeren Berlin looked to be in great shape with a third unanswered goal scored with a little over a minute to play before the final intermission at the Lanxess Arena in Cologne. The other half of Eisbaeren Berlin’s “Lock-Out” duo from the Philadelphia Flyers of the National Hockey League, DANNY BRIERE, put on a tremendous display of patience and skill to set up 21-year-old right wing LAURIN BRAUN in a prime shooting position. An eight goal of this D.E.L. term tied the younger of the two Braun brothers for the team lead with both Mulock and Rankel among the trainer Jackson’s charges. Eisbaeren Berlin star Canadian legionnaire DANNY BRIERE (84), who did miss the critical European Trophy contest in Sweden with HF Lulea on account of the flu, hiked his totals to 20 points (four goals) in ten D.E.L. contests after recording a pair of assists for the capital city club in the 3-0 triumph over Koelner Haie at the Lanxess Arena in North Rhine-Westphalia. Eisbaeren Berlin right wing LAURIN BRAUN, who appeared twice for Deutschland at the annual IIHF World Junior Championships earlier in his career, nabbed 10 goals from 68 games in all competitions for the D.E.L. champion last season but has already notched eight goals on his first 16 appearances in the German top flight to start this 2012/13 campaign. Koelner Haie launched an all-out offensive against the Eisbaeren net in the third period but discovered that Zepp, the well-seasoned veteran who has, up to this point statistically-speaking, NOT been having one of his best D.E.L. seasons, appeared determined to keep his sheet clean on this occasion. Krupp’s charges badly outshot Eisbaeren Berlin by the count of 13-5 over the final twenty minutes, but the visitors, in reality, had little reason to do more than defend; neither veteran Canadian legionnaire CHARLIE STEPHENS, who had four points for Koelner Haie in the first meeting of the season with Eisbaeren at the O2 World Arena Berlin, nor fellow Canuck CHRIS MINARD, the one-time Pittsburgh Penguins and Edmonton Oilers center who was signed this summer from the Grand Rapid Griffins of the American Hockey League and has quickly established himself as one of the D.E.L.’s top goal-scorers, could successfully break down the Berlin defensive wall. The in-from Zepp more than did his part, then, by turning aside all 35 Koelner Haie shots in the contest. Koelner Haie’s Swedish import ANDREAS FALK (71), the summer acquisition from Elitserien outfit HV 71 Jonkoeping who has managed just one goal in the D.E.L. this season so far despite dishing out a pile of assists already, is knocked off balance by Eisbaeren Berlin’s Canadian legionnaire MARK KATIC just in the knick of time and, thus, has his shot forced wide during the high-profile Deutsche Eishockey Liga contest at the Lanxess Arena in Cologne. An important triumph for Eisbaeren Berlin on so many different levels, as well. There is little question that the visitors from the defending champions capital city inflicted at least a bit of a blow to the psyche of the current Deutsche Eishockey Liga leaders. There is also no doubt that Jackson’s troops certainly can be very happy with all three points in the German elite league standings. Eisbaeren Berlin goaltender ROB ZEPP, the experienced veteran who has appeared for Deutschland in the international matches against both Austria and Canada already this 2012/13 season, also turned in a clean sheet for American trainer Don Jackson’s club in the pivotal European Trophy contest on the road in Scandinavia with Swedish Elitserien club HF Lulea and notched his second shutout of this D.E.L. term by white-washing Koelner Haie at the Lanxess Arena in the North-Rhine Westphalian city of Cologne. UPDATE — it was later determined that the shot from LAURIN BRAUN was actually tipped by Eisbaeren Berlin’s leading scorer this season, T.J. MULOCK; thus, the younger of the two Mulock brothers on the German capital city club was credited with his ninth goal of this Deutsche Eishockey Liga season. Koelner Haie defenseman TORSTEN ANKERT (81), the 25-year-old rearguard closing in on his 300th career regular season contest in the Deutsche Eishockey Liga, looks to effectively clear the puck just ahead of Eisbaeren Berlin’s brand new Canadian legionnaire DANNY BRIERE (84), the 35-year-old veteran who has already skated 813 games (280 go, 643 pts) in the National Hockey League, during the drama-filled, back-and-forth D.E.L. contest at the sold-out O2 World Arena in the capital city of Germany. After literally trading goals for two and a half periods, the table-toppers settled the issue once and for all with a pair of lightning strikes just 28 seconds apart as visting KOELNER HAIE held off two-time defending champion EISBAEREN BERLIN 6-5 in an action-packed Deutsche Eishockey Liga contest that conicided with the successful German debut of two locked-out National Hockey League stars from the Philadelphia Flyers. Eisbaeren Berlin’s Canadian legionnaire MARK KATIC (71), the diminutive defenseman who was taken in the third round (# 62 overall) of the 2007 National Hockey League Draft and later skated 11 NHL (0 go, 1 pt) games for the New York Islanders during the 2010/11 season, celebrates his first-ever goal in the German top flight with exiled Philadelphia Flyes star CLAUDE GIROUX (28) during the memorable D.E.L. contest at the O2 World Arena Berlin. Eisbaeren Berlin began well enough when star Canadian legionnaire CLAUDE GIROUX, the third-highest scorer in all the 30-team National Hockey League for the Philadelphia Flyers last season, passed the puck to young Canadian legionnaire MARK KATIC in the offensive zone. The 23-year-old blueliner, who excelled in the European Trophy tournament and led the capital city club with 12 points (three goals) but has struggled somewhat since the start of the domestic campaign, then worked an attractive give-and-go with the other new arrival from the NHL, the experienced Canadian international DANNY BRIERE. And, thus, Katic was finally able to net his first career goal in the Deutsche Eishockey Liga and provide Eisbaeren a 1-0 just six minutes into the very high-profile contest at the O2 World Arena Berlin. As would be a common theme throughout most of the evening, however, the advantage would not last long. In this case, visiting Koelner Haie would retaliate just one minute and seven seconds later through seasoned Canadian legionnaire CHARLIE STEPHENS. The 31-year-old center, who originally signed with EG Duesseldorf in the summer of 2006, would add three assists later to finish with four points and upstage the two Philadelphia Flyers star players on their debut for Eisbaeren Berlin. This clash of champions past and present would remain scoreless for almost thirty minutes thereafter, although both sides were, indeed, creating enough chances along the way. Koelner Haie’s Canadian legionnaire center CHARLIE STEPHENS was originally selected in the second round (# 31 overall) of the 1999 National Hockey League Draft by the Washington Capitals and, two years later, was taken in the sixth round (# 196 overall) by the Colorado Avalanche at the 2001 National Hockey League Draft. The native of London, Ontario, would ultimately appear in eight NHL games (0 go, 2 as) for the Colorado Avalanche but moved to Germany after totaling 23 goals and 67 points for the Binghamton Senators in the American Hockey League during the 2005/06 season. Stephens then transferred to Koelner Haie in the summer of 2011 after spending three campaigns with the Krefeld Pinguine. Eisbaeren Berlin were struck by misfortune with three and a half minutes remaining in the middle period. A clearing attempt by former Germany national team winger FLORIAN BUSCH riccocheted off the skate Germany national defender FRANK HOERDLER and right into the back of Berlin’s wide open net. Koelner Haie’s Canadian legionnaire NATHAN ROBINSON, the experienced D.E.L. 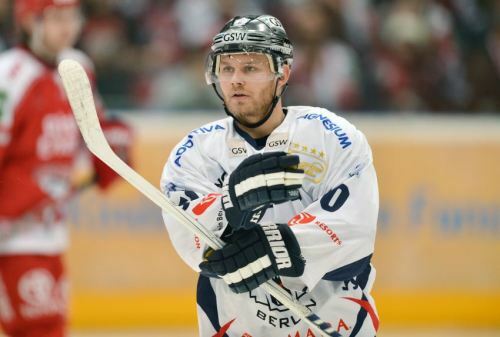 veteran who previously won two titles with Eisbaeren Berlin in 2008 and 2009, was formally given credit for the fortuitous goal against his former employers. Robinson, who has totaled two goals and eight points in 10 D.E.L. 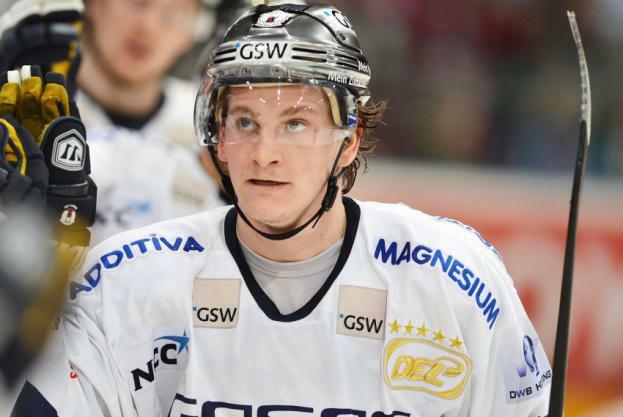 games for Koelner Haie since transferring from Austrian club EC Vienna Capitals in the summer, has been one of several off-season signings who have helped Krupp’s surprise club this term; Koelner Haie finished ninth in the D.E.L. regular season standings a year ago but have rocketed to the top of the German table this term. Koelner Haie right wing NATHAN ROBINSON, the 30-year-old native of Scarborough, Ontario, who skated in seven NHL games (0 go, 0 pts) for the Detroit Red Wings and Boston Bruins before originally signing to play for would-be D.E.L. champion Adler Mannheim in the summer of 2006, receives congratulations from fellow Canadian legionnaire CHRIS SIMARD (39) after being credited with a gift goal during the heavyweight clash with two-time defending Deutsche Eishockey Liga champion Eisbaeren Berlin at the soldout O2 World Arena Berlin. It would be the home side’s turn to respond quickly, however. Little winger LAURIN BRAUN was on hand at the side of the net to fire home a rebound and equalize for Eisbaeren Berlin with his second goal is as many D.E.L. matches. Koelner Haie’s lead had lasted a scant 47 seconds and Braun’s strike ensured that the two teams would adjourn for the final intermission all square at two goals apiece. 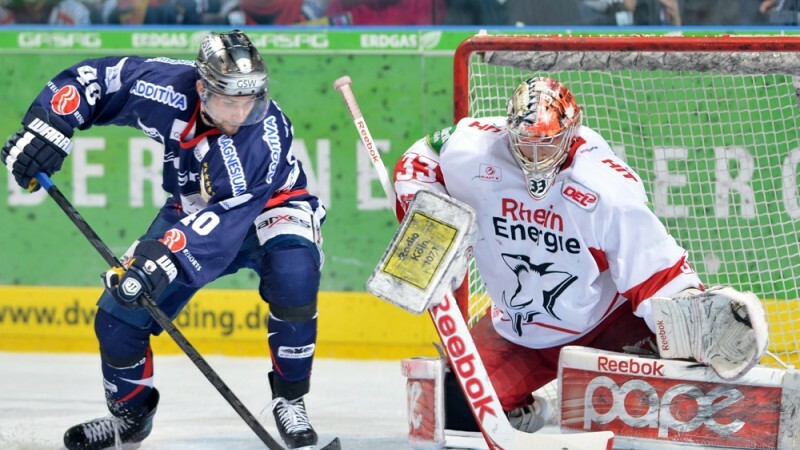 Koelner Haie goaltender DANNY AUS DEN BIRKEN (33) is powerless to prevent in-form Eisbaeren Berlin right wing LAURIN BRAUN from netting his first goal in the Deutsche Eishockey Liga contest at the soldout O2 World Arena in Berlin; the 21-year-old Braun, who scored 10 goals in 68 games all competitions for the capital city club a year ago, already has registered five goals in only fifteen games (both European Trophy and D.E.L.) to start this season. After scoring a combined four goals in the first forty minutes of play, the two opponents then treated the sellout crowd of 14,200 spectators on hand to an offensive explosion that featured no fewer than seven pucks bulging the back of the net at the ice hockey rink near the Ostbahnhof in Germany’s capital city. In the end, the decision by the Eisbaeren trainer to suit up only four defensemen could very well be interpreted to have backfired on Berlin; of the four goals Koelner Haie scored while Eisbaeren Berlin were operating at full strength, twice Jackson’s troops were caught with four forwards on the ice all at the same time. Koelner Haie captain JOHN TRIPP (21), who was originally taken in the third round (# 77 overall) of the 1995 National Hockey League Draft by the Colorado Avalanche and later skated 43 NHL games (2 go, 9 pts) for the Los Angeles Kings and New York Rangers, celebrates his first goal of the high-profile contest against two-time defending D.E.L. champion Eisbaeren Berlin at the soldout O2 World Arena with highly-experienced former NHL defenseman DANIEL TJARNQVIST (34), the 36-year-old, off-season signing from Elitserien outfit IF Djurgarden Stockholm who earned an Olympic gold medal with Sweden at the 2006 Winter Games hosted by Turin, Italy. Koelner Haie’s aging captain JOHN TRIPP sent the visitors in front again after an outstanding individual effort for the visitors five minutes into the third period. The 35-year-old native of Kingston, Ontario, who has represented Germany at six major international tournaments (39 ga, 6 go, 10 pts) since his debut for Deutschland at the 2007 IIHF World Championships, beat Eisbaeren Berlin’s imported American defenseman JIMMY SHARROW along the boards and then walked right out in front. Tripp’s initial shot was saved by Eisbaeren Berlin’s native Canadian-turned-Germany national team goaltender ROB ZEPP but the well-traveled NHL veteran was able to notch his third goal of this D.E.L. campaign on the rebound. Yet once more, though, the team that had just conceded a goal struck back very quickly to level the contest. Much attention prior to the match had been focused on Eisbaeren Berlin’s two new NHL stars and Giroux justified that hype somewhat exactly one minute and two seconds after Tripp’s crowd-quieting tally. The incoming star Canadian legionnaire reigninted the audience by receiving a sharp cross-ice pass from his Flyers buddy Briere and netting his very first German goal on his D.E.L. debut with a deadly accurate wrist shot from the top of the the faceoff circle to the right of helpless Koelner Haie goaltender DANNY AUS DEN BIRKEN. “DER NHL-TOPSTAR HAT SEIN ERSTES TOR IN DEUTSCHLAND GESCHOSSEN” — Germany national team defenseman FRANK HOERDLER (7) taps newly-arrived Canadian legionnaire DANNY BRIERE on the head as Germany Olympic forwards T.J. MULOCK (15) and ANDRE RANKEL join in the celebration of a first goal for Eisbaeren Berlin in the Deutsche Eishockey Liga by incoming Canadian legionnaire CLAUDE GIROUX (28) at the O2 World Arena Berlin. The NHL veterans Stephens and Tripp were both involved for Koelner Haie as the see-saw affair continued nearing the halfway point of the final period. Off-season signing ANDREAS HOLMQVIST, the 31-year-old defenseman who was selected by the Tampa Bay Lightning in the second round (# 61 overall) of the 2001 National Hockey League Draft, ended up with the puck between the faceoff circles and rifled a slapshot past Zepp to score his third goal of this young D.E.L. season. Holmqvist, who won a gold medal with Sweden at the 2006 IIHF World Championships and arrived in the summer after transferring from IF Djurgarden Stockholm, is tied for third with 10 points for Koelner Haie this term. But, a little more than a minute and a half later the in-form, little winger Braun would reset the scoreboard at the O2 World Arena to 4-4 with his second goal in the contest with Koelner Haie. Eisbaeren Berlin’s Canadian legionnaire MATT FOY, the NHL veteran signed this summer who had scored two goals in his last two D.E.L. games heading into the clash with Koelner Haie, set the play up and earned his second assist on the match in the process. Braun neatly whacked a floating puck out of the air past aus den Birken to score his third goal in his last two games for the capital city club. Finally, Stephens and Tripp combined to provide Koelner Haie with a lead which would not be relinquished and, ultimiately, stole the spotlight from Eisbaeren Berlin’s two far more accomplished NHL stars. Koelner Haie captain and Germany national team veteran JOHN TRIPP (21), who has been skating in the D.E.L. since first signing for Adler Mannheim in the summer of 2004 and has also worn the sweaters of ERC Ingolstadt, Hamburg Freezers and Hannover Scorpions in his career, is surrounded at the side of the net after scoring his second goal of the back-and-forth Deutsche Eishockey Liga contest against two-time defending champion Eisbaeren at the soldout O2 World Arena Berlin. Four-point hero Stephens burst into the Eisbaeren zone down the left wing and backhanded a pass in front for Tripp to simply redirect past Zepp at the 12:13 mark of the third period. And only 28 seconds later, Germany national team winger PHILIP GOGULLA, the 25-year-old, one-time second round pick (# 48 overall) of the Buffalo Sabres at the 2005 NHL Draft who has already represented Deutschland at six major international tournaments (39 ga, 4 go, 22 pts), struck again for Koelner Haie. After rushing the puck into the zone and dropping the disc for the trailing Swedish defenseman Holmqvsit, an unmarked Gogulla at the side of the net skillfully one-timed a sharp, cross-ice pass from the summer signing to score his fourth goal of this D.E.L. campaign and give visiting Koelner Haie an insurmountable 6-4 lead. This time, there would be no way back for Eisbaeren Berlin. Eisbaeren Berlin’s superstar Canadian legionnaire CLAUDE GIROUX (28) battles for a loose puck in front of the net with Koelner Haie defenseman MORITZ MUELLER (91), the 25-year-old rearguard who appeared in all six games for Germany at the 2009 IIHF World Championships in Switzerland, during the exciting Deutsche Eishockey Liga contest watched by a sellout crowd of 14,200 spectators at the O2 World Arena Berlin. One can easily find the “HIGHLLIGHT VIDEOS” section on the right hand side of the home page. The contemporary powerhouse EISBAEREN BERLIN have won the Deutsche Eishockey Liga title the last two years in a row and, all told, have been crowned champion in the German top flight six of the past eight seasons. KOELNER HAIE, whose glory days coincided with a five-year stretch which saw the club capture four titles in the old West German Bundesliga during the mid-1980s, have not claimed a domestic championship since 2002 but will invade the O2 World Arena in Berlin as the current D.E.L. leaders this term. A battle of past and present titans, then, as the two clubs collide Friday in a contest that will mark the German debut of locked-out Philadelphia Flyers star players DANNY BRIERE and CLAUDE GIROUX. Despite being undrafted coming out of junior hockey, Canadian legionnaire JULIAN TALBOT (48) skated in 303 American Hockey League games (75 go, 173 pts) for the Providence Bruins, Peoria Rivermen and Lake Erie Monsters before crossing the Atlantic Ocean to sign with Eisbaeren Berlin in the summer of 2011; the 27-year-old left wing totaled 21 goals in all compeitions for Eisbaeren his first year in Germany. 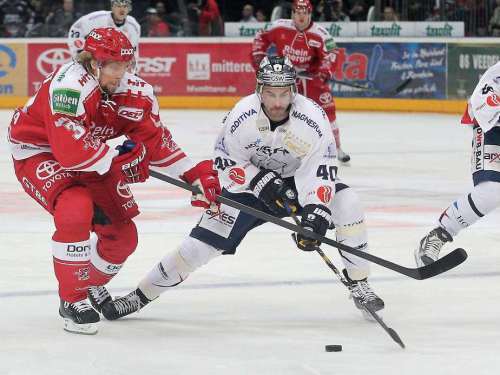 Eisbaeren Berlin surprisingly lost three of their first four games this 2012/13 D.E.L. season under veteran American trainer DON JACKSON, the former University of Notre Dame defenseman who won two Stanley Cups in the mid-1980s with Wayne Gretzky and the star-studded Edmonton Oilers. Since then, though, the capital city club have rebounded to win four of their last five contests, including the past three in a row. Eisbaeren have been missing several key injured players, last season’s leading scorer notwithstanding, it should be noted. Perhaps most indicative of the absence of Canadian legionnaire DARIN OLVER, the former high draft pick of the New York Rangers who led Eisbaeren Berlin with 30 goals in all competitions last term, is the fact that the leading goal-scorers for the capital city club this season so far in the European Trophy tournament as well as the Deutsche Eishockey League are both defensemen. American import JIMMY SHARROW has scored five goals in seven European Trophy contests this summer while Germany national team defenseman FRANK HOERDLER leads Jackson’s troops with four goals in nine D.E.L. games to start this campaign. The 27-year-old Hoerdler, a youth team product who has represented Deutschland at five major international tournaments in his career, currently has a three-game goal-scoring streak going for himself. Surely, Briere and Giroux will be expected to add major firepower to Eisbaeren Berlin immediately, then. American import BARRY TALLACKSON, the 29-year-old, former University of Minnesota product and New Jersey Devils prospect who was second for titlist Eisbaeren Berlin having scored 29 goals in 73 games in all competitions last season, has found the back of the net just twice in 16 games in all competitions for the capital city club thus far this term. The most glaring weakness for Eisbaeren Berlin appears to be a lack of veteran presence on the blueline due to both injury and off-season losses. This has obviously placed additional strain on Germany national team goaltender ROB ZEPP, the 31-year-old veteran who currently has the highest goals-against-average (3.24) of all netminders in the D.E.L. who have played at least three games this season. In the meantime, youthful defenders such as San Jose Sharks draft pick DOMINIK BIELKE, MAXIMILIAN FABER, HENRY HAASE and THOMAS SUPIS are all gaining valueable experience along the way. 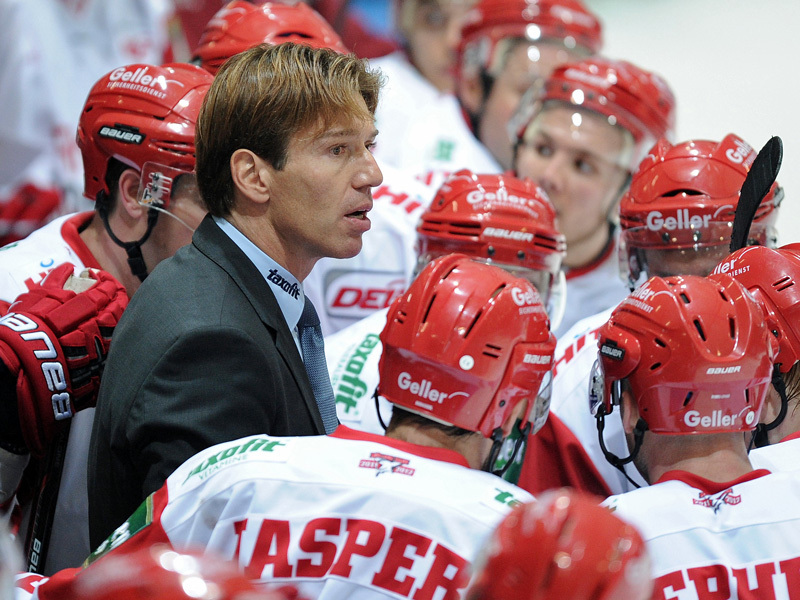 KOELNER HAIE, meanwhile, have lost just once in nine games to open this 2012/13 campaign under former Germany national team trainer UWE KRUPP. A high-octane attack which has scored 31 goals (2nd most in the Deutsche Eishockey Liga) and a stingy defense have been the hallmarks of a new-look side that made several key acquisitions in the off-season summer. Koelner Haie, of course, finished ninth in the regular season standings and were swept four games to none by Eisbaeren Berlin in the first round of the D.E.L. playoffs last season. The biggiest addition has been that of in-form Canadian legionnaire CHRIS SIMARD, the 30-year-old native of Owen Sound, Ontario, who arrived in the summer from the American Hockey League’s Grand Rapids Griffins; Simard, who skated 40 NHL games (2 go, 6 pts) in parts of three seasons for the Pittsburgh Penguins and Edmonton Oilers, is leading the entire D.E.L. with eight goals from his first nine contests in Germany and is also tied for second with 11 points, as well. Another important transfer for Krupp’s team is proving to have been that of veteran defenseman ALES KRANJIC from HC Ceske Budejovice in the Czech Republic as the 31-year-old Slovenia international defenseman is currently second on Koelner Haie with four goals in the D.E.L. this term. A pair of veteran Sweden international defensemen signed in the summer from IF Djurgarden Stockholm, ANDREAS HOLMQVIST and DANIEL TJARNQVIST, have also certainly helped to fortify the blue line and allow for success. Holmqvist is tied with Kranjic for second among all Koelner Haie players having totaled eight points in the D.E.L. thus far this season. The 35-year-old Tjarnqvist earned an Olympic gold medal at the 2006 Winter Games in Turin, Italy, and has appeared in 352 NHL contests (18 go, 90 pts) for the Atlanta Thrashers, Minnesota Wild and Edmonton Oilers in his career. Koelner Haie goaltender DANNY AUS DEN BIRKEN is ranked second among all netminders with at least three outings in the Deutsche Eishockey Liga this season with both a 1.61 goals-against-average as well as a .948 save percentage … Germany Olympic center T.J. MULOCK (15), the 27-year-old native of British Columiba who began his professional career with the third division Ratinger Ice Aliens, leads Eisbaeren Berlin and is tied for second in all the D.E.L. with 11 points (three goals) in nine D.E.L. games. Luckily, though, this blog made the decision to follow the unique Eisbaeren Berlin earlier this summer and has been providing match reports for the capital city club starting with the European Trophy clash with Austrian side HC Red Bull Salzburg in late August. And so, you can consider yourself formally saved. The official website of the Deutsche Eishockey Liga provides a free streaming link to a featured ‘Match of the Day’ for every round in the German top flight. As previously noted at this blog, the Eisbaeren Berlin vs Koelner Haie tilt was selected as the October 12 contest some time ago, long before the two NHL stars signed to play in Deutschland with the two-time defending champions. Sometimes, the streaming link found at the D.E.L. website is a broadcast from SERVUS-TV and, other times, the match being shown at the D.E.L. website is a broadcast by LAOLA1.TV. The Eisbaeren Berlin – Koelner Haie contest on Friday, October 12, is being shown at the D.E.L. website by LAOLA1.TV and, so, that is the most important thing to remember with respect to the German debut of Briere and Giroux. The LAOLA1.TV broadcast of the Eisbaeren Berlin – Koelner Haie showdown from the O2 World Arena Berlin starts at 7:25 PM local time, which translates for the blog into 1:25 PM EST here in the United States. The official website address of the Deutsche Eishockey Liga is …………….. When first calling up the D.E.L. page, one will notice the standard banner and a large picture to accompany the lead news story right below that. Just under this main news photo will be a list of all the league’s contests for Friday, October 12. The match schedule appears under the word “Spieltag”. The Eisbaeren Berlin – Koelner Haie contest is listed first and to the right will be the LAOLA1.TV symbol as displayed here — CLICK ON THAT SYMBOL AND GO STRAIGHT TO THE FREE LIVE STREAMING BROADCAST, ITSELF. There is also a direct link to the broadcast on the main page of the Deutsche Eishockey Liga website directly to the right of the main news photo. This section is entitled “LIVE VIDEOS” and, again, the Eisbaeren Berlin – Koelner Haie match is the first option displayed. Here, one can also review the future ‘Match of the Day’ schedule in the D.E.L. and will note, for example, that Eisbaeren will next be featured on October 21. Legendary KOELNER HAIE trainer UWE KRUPP, the long-time National Hockey League defenseman who once scored a triple overtime goal to clinch the coveted Stanley Cup for the Colorado Avalanche back in the day, will lead his charges into the packed O2 World Arena Berlin on Friday placed first in the Deutsche Eishockey Liga this season and ready to face two-time defending champion Eisbaeren Berlin’s new pair of NHL exiles from the Philadelphia Flyers in a very high-profile, early-season contest in the German capital city. 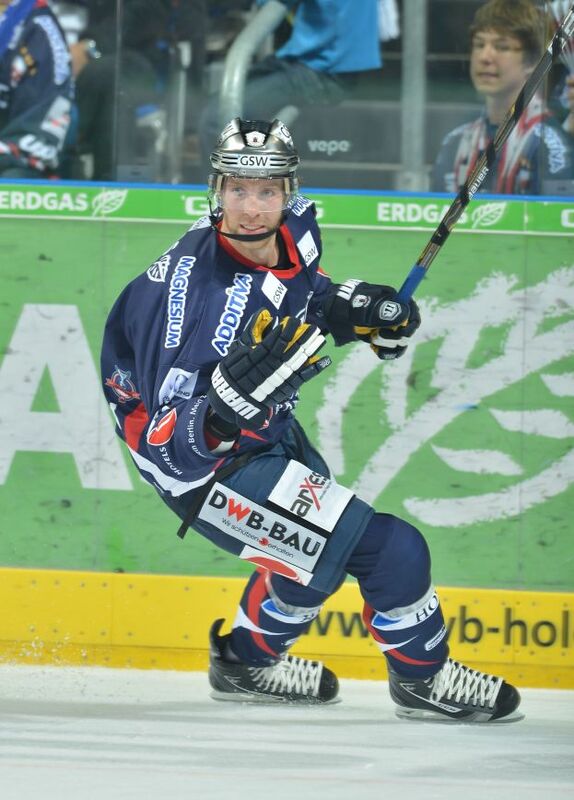 German Olympic forward THOMAS GREILINGER snapped a 3-3 stalemate with less than seven minutes to go in the winner-take-all match as ERC INGOLSTADT advanced to the Deutsche Eishockey Liga playoff quarterfinal round with a 6-3 win over visiting KOELNER HAIE in Bavaria. Slovak international IVAN CIERNIK had given the Cologne a 2-0 first period lead with a pair of goals for a promising Shark start this Palm Sunday. The one-time Portland Pirate struck a second time on the power play after Ingolstadt’s TYLER BOUCK was bounced from the game for a hit to the back of Czech DUSAN FROSCH’s head. Bouck, the 30-year-old, two-time Canadian IIHF World Junior international and former second round draft choice of the Dallas Stars, signed for ERC Ingolstadt this past off-season after two years in American Hockey League with the Portland Pirates. Ingolstadt rallied at home to even the score in the second period at the Saturn Arena (attendance – 3,426), however. German MICHAEL WAGINGER, with the man-advantage, and former University of Minnesota Golden Gopher BEN CLYMER were able to lift the Bavarian club out of the hole heading into the final frame. The defenseman Clymer presented Ingolstadt with their initial lead of the matinee match on the power play roughly three minutes into the third period. But ex-Michigan State University Spartan BRYAN ADAMS, an NCAA tournament champion a dozen years ago, brought Koelner Haie level just past the nine-minute mark. Greilinger, who led the Deutsche Eishockey Liga with 38 goals during the regular season, shot Ingolstadt out front for good exactly four minutes later. Former Philadelphia Flyers second round pick PAT KAVANAGH converted a pass from Clymer past Koelner Haier netminder NORM MARACLE with three minutes minus one second remaining to increase the Ingolstadt margin and effectively seal matters. German Olympic defenseman JAKUB FICENEC tacked on an empty-netter with nineteen seconds to go. The 31-year-old Clymer, a former second round selection of the Boston Bruins and veteran of 438 National Hockey League contests, last played in North America with the AHL’s Hershey Bears before leaving to link with Belarussian club Dynamo Minsk to start the 2008-09 campaign. In his first year with Ingolstadt this season, the United States international totaled eight goals and 32 points in 37 DEL games. 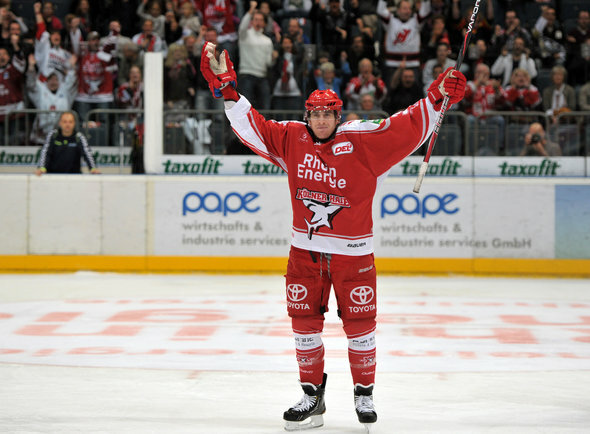 Clymer was Herculean with his two goals, four points versus the Sharks and was easily selected as the man of the do-or-die playoff match by the official website of the Detusche Eishockey Liga, www.del.org. 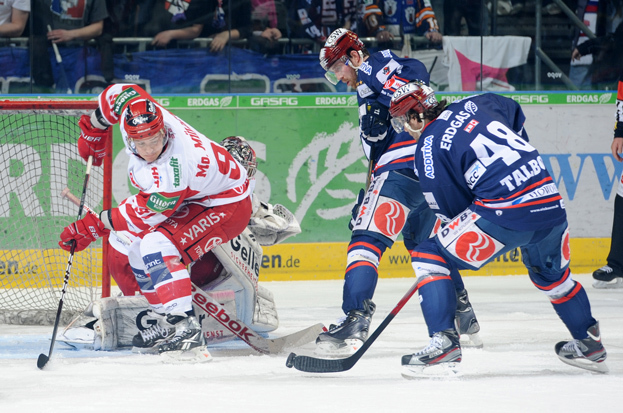 KOELNER HAIE could not take advantage of its opportunity on home ice and allowed ERC Ingolstadt to even the Deutsche Eishockey Liga quarterfinal qualification series with a 3-2 victory in overtime at the Lanxess Arena. Czechoslovak-born German Olympic defenseman JAKUB FICENEC, who played junior hockey in British Columbia before skating 125 games (24 go 27 as, 51 pts, 77 pim) for the Portland Pirates in the American Hockey League at the beginning of the millenium, found the back of net for Ingolstadt in the 14th minute on the power play. Ingolstadt once again applied a great deal of pressure in the opening period, but, once again, as in the playoff opener, Koelner Haie goalkeeper NORM MARACLE managed to keep his club in the match with fifteen saves. Five seconds following the midpoint of the game, forward RICK GIRARD added another goal for Ingolstadt, again with a Cologne Shark seated in the penalty box. For Girard, the former Canadian junior international who spent three seasons with the AHL’s Syracuse Crunch (159 ga, 44 go 62 as, 106 pts, 74 pim) in the mid-1990s, it marked his second goal in as many games against Maracle. The Sharks’ puckstopper, of course, put in four AHL seasons himself in the mid-90s for the Adirondack Red Wings. Koelner Haie did respond in the second half of the second period. Mid-season free agent signing MARC CHOUINARD, who hit the post in the 32nd minute, drew Cologne within one with a goal five minutes from the end of the second session. Chouinard collected his first DEL playoff goal after a fine pass from the Czech forward DUSAN FROSCH. With less than a minute to go in the middle period, Norwegian Olympic defenseman MATS TRYGG tied the score with the Sharks skating on the man-advantage. 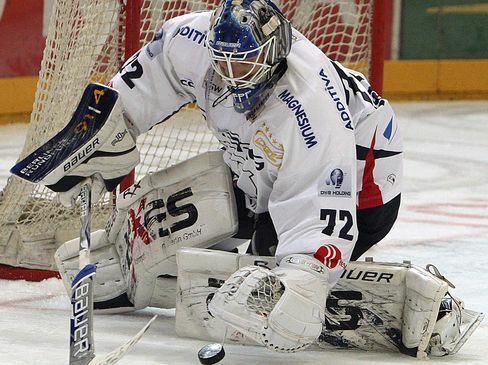 In the third, Maracle was again a major factor with a further fourteen saves; the one-time Stanley Cup winner enjoyed another outstanding game for Koelner Haie and ended with an even 50 saves for the night. Meanwhile, German Olympic goaltender DIMITRI PAETZOLD rebounded from a dreadful performance in the playoff opener and also kept a cleansheet for ERC Ingolstadt. The former San Jose Sharks farmhand finished with 29 saves. Thus, an extra session was required. Ingolstadt dominated overtime as evidenced by the lopsiped 7-1 shots-on-goal total. Trygg would take a controversial penalty for Koelner Haie at the 8:18 mark of overtime. And so, with just 27 seconds left in added time, Ficenec facilitated the winner for Ingolstadt with his second goal of the game and tied the playoff series with Koeln at one win apiece. A crowd of 9,293 turned out what for could be the final game of the season at the 18,500-seat Lanxess Arena Friday night in Cologne. A final, winner-take-all match between Koelner Haie and ERC Ingolstadt will be contested Sunday at the SATURN ARENA in Ingolstadt, Bavaria. 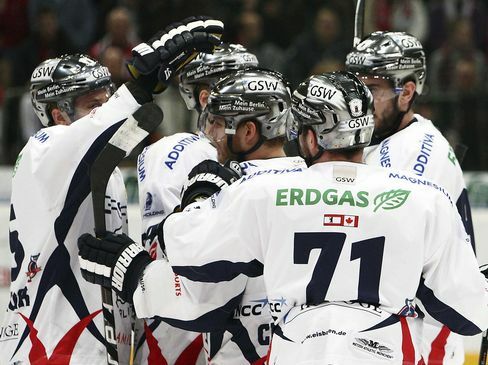 10th seed KOELNER HAIE (Cologne Sharks) received six goals from six different players and stormed to a surprise 6-1 opening-game victory on the road over 7th-seeded ERC Ingolstadt on the road in the Deutsche Eishockey Liga playoffs. Cologne coach BILL STEWART made a significant move by benching Swiss international goaltender LARS WEIBEL, who had appeared in 48 (3.12 avg, 90.6 sv pct) of the Sharks’ 56 regular season contests. Replacement netminder NORM MARACLE, a former Stanley Cup winner with the Detroit Red Wings, enjoyed an oustanding match and finished with 33 saves. The 35-year-old veteran, who arrived in January from Croatian club HK Olimpija Ljubljana of the Austrian Erste Bank Eishockey Liga, was of paramount importance in the opening period. Maracle kept ERC Ingolstadt off the scoreboard as the Sharks were heavily outshot 18-6 in the opening twenty minutes. 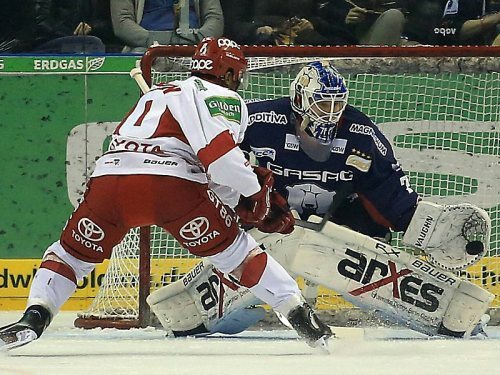 Maracle had played just five DEL games for Koeln (3.22 avg) and entered the playoff tie with ERC Ingolstadt sporting an 0-3 won-loss record in between the pipes for die Haie. Ingolstadt did score eighteen seconds into the middle frame thru former Vancouver Canucks 1993 2nd round draft choice RICK GIRARD. But, the Sharks would respond with four second period goals despite again being outshot for the session. IVAN CIERNIK, BRYAN ADAMS, JASON JASPERS and CHRISTOPH MELISCHKO all lit the lamp for visiting Koeln. Die Haie, who reported played a very aggressive and physical match, added third period tallies from DANIEL RUDSLATT and CHRISTOPH ULLMANN. Adams, Jaspers, Ullman and German Olympic forward MARCEL MUELLER, who mustered a pair of assists, all collected two points for Cologne in the contest. Cash-strapped Koelner Haie can put away ERC Ingolstadt in the short, best-of-three mini-series and advance to the quarterfinals of the DEL playoffs with a victory on Friday at the Lanxess Arena in Cologne.